A knife should be field tested in the field, under the conditions it was designed for. This Fire Creek Forge Wilderness Scout II came through with flying colors. I love handmade stuff. I like knowing that somebody put their passion for the art, and their skill and hard work into creating something. IMO, that makes a tool into a work of art. 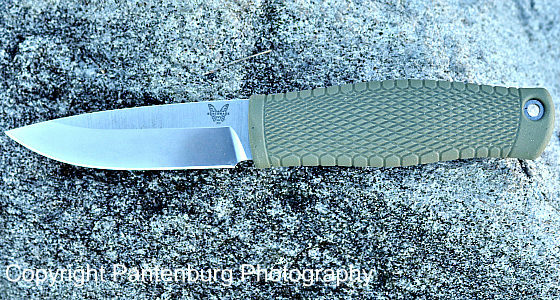 The Dry Creek Scout II is a large-sized knife that can handle many wilderness tasks. But I’m not going to wax poetic about a knife when there is a field dressing job to do. Like immediately. The whitetail doe died in her tracks after the shot. It was 4:15 p.m. and sunset would be in about an hour. That meant I had about an hour to gut, field dress, skin and quarter the carcass. Then I had to carry the meat about half a mile to the nearest road. Heavy rains had saturated the soil, and standing water in the ruts in the road meant I couldn’t get any closer with a vehicle. Just then, I needed a user knife that could get the job done. That’s what Elijah Williams, of Fire Creek Forge, sent me a while back when I got the Wilderness Scout II. I just needed the right circumstances to properly wring it out. This was my first knife in 80CrV2, so I’ll be paying close attention to how the steel works out. The knife was used in the kitchen and left – unintentionally – wet in the sink. Overnight, it developed a few rust spots and stains. If the blade is wiped off after every use, that shouldn’t be a problem. It appears to me that the blade will patina nicely, and so far, the steel appears to hold an edge well. But I was not interested in patina, so I rubbed down the blade with Simichrome Polishing paste and the mirror finish was easily restored. Grind: My favorite grind is convex. IMHO, it is the best for any knife that’s primary use would be as a hunting knife. But any knife I would take into the back country would also have to be sturdy enough to be a survival knife. In this case the full flat grind, with micro bevel, of the Wilderness Scout works well. The green micarta handle never got slippery, even when wet. Handle: The knife I got was in green matte micarta, which is a favorite of mine. Micarta is bullet-proof, and gets tacky when wet or damp. 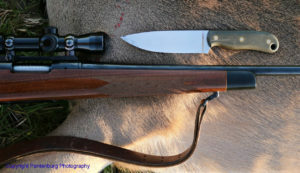 This is important for a hunting knife that might get bloody field dressing big game animals or slippery from fish slime. It’s also important if the knife might be used in wet and/or cold situations. During the gutting and skinning of the deer, the handle got blood on it, but was never slippery. I also handled the knife while wearing bloody, cut resistant gloves over latex gloves. I never felt a loss of control. Another handle design feature that deserves mention is the heel. The end of the blade protrudes from the handle like a chef’s knife does. It virtually guarantees that your handle can’t slip down onto the blade. It also means you won’t keep hitting your knuckles when slicing on a board or chopping block. Point: A drop point is a good choice for an overall knife. It works well for field dressing big game, and for some of the piercing tasks associated with field dressing big game. For a camp knife, this is also a good choice, since the knife may be called upon to fillet fish, cut cheese or slice meat. Lanyard hole: Large and generous, the hole at the end of the handle will accommodate a 1/4-inch piece of paracord or rope. I use a lanyard on my wilderness knives, particularly in deep snow. Here is why. Sheath: A quality sheath protects the edge and the user. This scout’s sheath is made of 7/8 ounce full grain leather, with a D ring for dangler attachment. This is my favorite way to carry a large knife, and I use this style on smaller knives, as well as on full-size Bowies. The sheath shows attention to detail and the workmanship is good. This is not a “safe queen” sheath, but it is an attractive, good-looking piece of leatherwork designed for a working knife. The sheath will do the job and provide years of service. Made in USA: The Wilderness Scout III was entirely handmade in Potlatch, Idaho by American craftsmen who earn a living wage. These folks are our friends and neighbors and they contribute to the local economy. Buy a USA-made knife, and help out a business that pays local, state and federal taxes. Support American small business! Price: At $250, which includes shipping in the USA, this is a fair price for a quality knife. 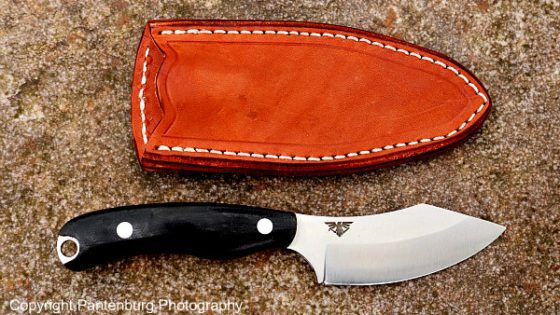 For a handmade, custom knife that comes with a sturdy, well-made leather sheath, this is a steal. How the Wilderness Scout worked out: The name implies that this is not a hunting knife per se. Because of the time of year, most of my outdoor activities are centered around deer hunting. I used the scout as a hunting knife, and it performed well. It also is an excellent camp knife, and it slices meat and vegetables well. You can whittle sticks with it, and carve tent pegs. It will do just about anything you might need a knife for. I get nit-picky on reviews, because you’ve read this far to get all the details before you invest in a knife. My opinions are based on my standards, and yours are probably different. 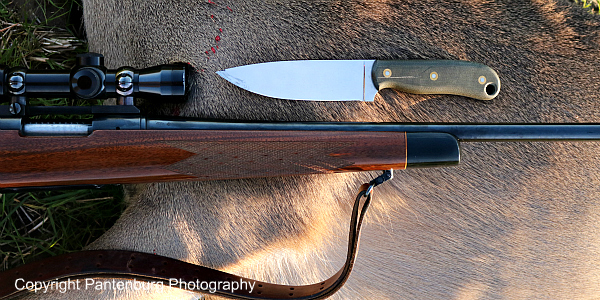 Sharpness: I am OCD about knife sharpness, which is a good thing for the people I hunt with. I like sharpening blades, and take along all my sharpening gear to camp. At night, I’ll touch up any knives that need it. If an edge won’t shave, IMO, it isn’t sharp enough. Out of the box, the Wilderness Scout was not sharp enough for my tastes. It would cut paper with no problem, but wouldn’t shave my arm easily. A quick strop fixed that, and the edge was soon scary, wicked sharp. Like I said, nit-picky. Grind: I like a flat grind with a micro bevel, but this blade cries out to be convexed. As it is used, and stropped correctly, the edge will eventually wear into a convex. This is not a deal breaker for most people, but us picky users want exactly what we want. The flat grind is excellent for a knife that will be used mostly as a slicer. More belly on the blade: We’ve already pointed out that the scout is not designed to be a hunting knife. But any knife I take on a hunt must be able to do it all, since I may end up killing a big game animal in an isolated area. I would prefer that there be a little more curve from the tip on back about two inches. This would make the knife a better skinner, and IMO more versatile overall. The Wilderness Scout might not be the best choice for a hunting knife, but if you’re not a hunter that isn’t a consideration anyway! Where this knife excels is in the overall category. It is a good carving knife. It slices food well. It has a great design and handles well for a knife this size. It is sturdy and well-designed enough to be a survival knife. If you’re looking for a knife that can cover a wide range of wilderness blade tasks, this Wilderness Scout is worth considering. Contact Fire Creek Forge.